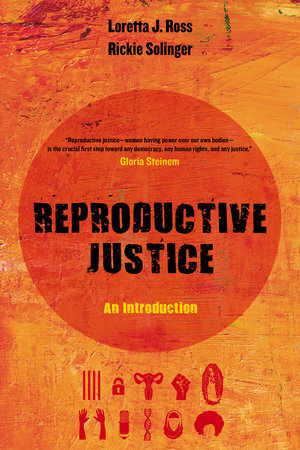 Reproductive Justice is a first-of-its-kind primer that provides a comprehensive yet succinct description of the field. Written by two legendary scholar-activists, Reproductive Justice introduces students to an intersectional analysis of race, class, and gender politics. Loretta J. Ross and Rickie Solinger put the lives and lived experience of women of color at the center of the book and use a human rights analysis to show how the discussion around reproductive justice differs significantly from the pro-choice/anti-abortion debates that have long dominated the headlines and mainstream political conflict. Arguing that reproductive justice is a political movement of reproductive rights and social justice, the authors illuminate, for example, the complex web of structural obstacles a low-income, physically disabled woman living in West Texas faces as she contemplates her sexual and reproductive intentions. In a period in which women’s reproductive lives are imperiled, Reproductive Justice provides an essential guide to understanding and mobilizing around women’s human rights in the twenty-first century. Reproductive Justice: A New Vision for the Twenty-First Century publishes works that explore the contours and content of reproductive justice. The series will include primers intended for students and those new to reproductive justice as well as books of original research that will further knowledge and impact society. Learn more at www.ucpress.edu/go/reproductivejustice. Loretta J. Ross is a cofounder of the SisterSong Women of Color Reproductive Justice Collective and the cocreator, in 1994, of the theory of reproductive justice. She has addressed women’s issues, hate groups, and human rights on CNN and in the New York Times, Time magazine, Los Angeles Times, and USA Today. Rickie Solinger is a historian and curator and the author or editor of many books about reproductive politics, including Wake Up Little Susie: Single Pregnancy and Race before Roe v. Wade.